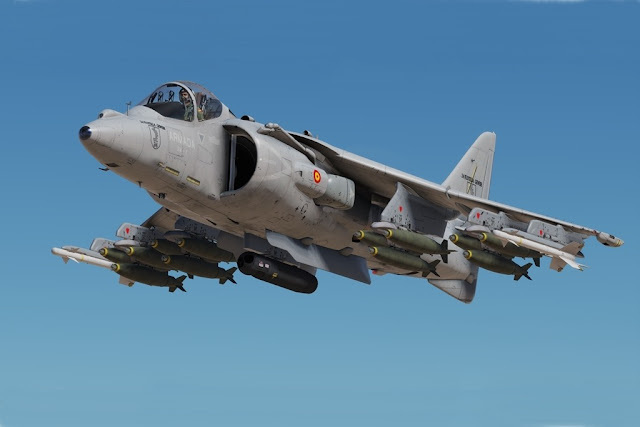 Home / Industry / Spanish Air Force / Spanish Harrier needs a replacement quickly. Will Spain look at the F-35B or will it end Armada's fixed-wing fleet? Spanish Harrier needs a replacement quickly. Will Spain look at the F-35B or will it end Armada's fixed-wing fleet? Spanish Harrier needs a replacement quickly. Will Spain look at the F-35B or will it end Armada's fixed wing fleet? The Armada Espanola (Spanish Navy) has a short-term problem to face considering that in a few years its Harrier jump jets will end their service life. The nation must decide quickly whether to continue with a fixed-wing fleet or keep only an helicopters fleet. In 2016, the Admiral Chief of Naval Staff, Jaime Muñoz-Delgado, stated that the Armada aircraft will end their operational life between 2025 and 2027 and the market only offers a vertical takeoff and landing aircraft, the F-35B. However, the Spanish defense can not currently proceed with Lockheed Martin's solution because of the limited budget. The price of a Marines F-35B is set at $115.5 million. Today the Spanish Navy has a fleet of 12 AV-8B Harrier II Plus aircraft introduced almost 35 years ago. In November 2014, the Ministry of Defense extended the agreement to support the Harrier program after approving an investment of € 47.6 million (US $ 54.1 million) between 2014 and 2024. The Spanish Defense Minister is looking at a joint strategy with the Spanish Air Force, which in 2020 will have to start evaluating a new aircraft to replace its F-18 Hornets. This solution would allow the nation to purchase a larger package of aircraft at a lower cost. According to some analysts, the Spanish Navy will decide to continue with only helicopters. The latest funds have been allocated to new helicopters as confirmed by the purchase of new NH-90s. The Italian Defense had to face the same problem years ago and as is well known, Italy has opted to introduce the F-35B jointly with the Italian Navy and Air Force.